A full planning application has been submitted to the Scottish government for a 50-turbine wind farm. The Sanquhar II project is described by developers Community Windpower as a "natural extension" of a nine-turbine scheme already operating in the area. The proposed wind farm is located west of Sanquhar and south of Kelloholm in Dumfries and Galloway. The company said the majority of the turbines involved would have a tip height of 200m (650ft). 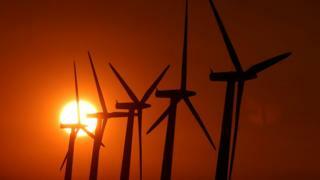 It claimed the development could "contribute substantially" to the Scottish government's renewable energy targets. However, an online petition against the proposals has gathered more than 700 supporters. It said the scheme would have an "unacceptable landscape and visual impact" on the area.